Top workmanship, made in Germany. The new World Champion 89 blade series is exceptional. It celebrates the 25th anniversary of Sweden winning the World Championships Team title in Dortmund in 1989 (in a historic 5-0 final win against China). DONIC is exclusively producing three new blades in Germany, in honour of the legends Jan-Ove Waldner, Jörgen Persson und Mikael Appelgren. Hand crafted and employing the most modern precision and technical know-how, in acknowledgement of the supreme mastery with which the Swedish Superstars played. All three models have incorporated an Italian Spruce ply which is over 200 years old. This is combined with a 3mm strong centre veneer of Kiri and for the Appelgren All+ model, Ayous combined with a new Carbonfleece Zylong webbing (CF2), exclusive for DONIC. Only the finest saw plies of our own production are being used. These are more stable than the usual knife plies and are a guarantee that the blade retains its playing characteristics without the normal deterioration. A specially developed drying procedure reduces the moisture content of all three types of blade from 12 to 16% to only 4%, resulting in a stable and light blade (Waldner and Persson blades weighing approx. 85g and the Appelgren All+ blade only 80g approx.) Each individual blade is subjected to a special cold press for 24 hours. The employment of our unique 3D-technology and the most recent bio technology ensures that the handle is in perfect shape. This is a fast blade but with great feel and ease of control. Designed for players who require a balance between speed and control. 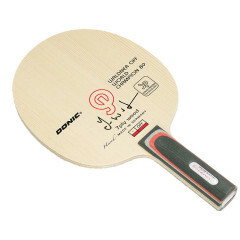 Donic Blade World Champion 89 Waldner is beeing added to cart.